Click on the name of each adventure to expand details! Everyone should go. But the reality is, Zion is having growing pains. Parking lots fill early in the day and shuttle buses are cramped. BaseCamp 37° can help you formulate a plan to negotiate the congestion in Zion Canyon. We can also point you to the less crowded eastern sections of the park, 39 “fun to drive” miles from Basecamp 37°. Without question, this is most famous and photographed slot canyon in the world. With credentials like this, you can imagine the crowds will follow, and they have. If this is on your bucket, please go! Guided tours are required for access to both Lower and Upper Antelope Canyon, and reservations are a necessity. For a different point of view, consider renting kayaks or taking the guided boat tour from Antelope Point Marina, a leisurely one hour trip into the Antelope Canyon from Lake Powell. BaseCamp37° is conveniently located about halfway between Zion NP and Antelope Canyon. One of our favorites! Cool temps dampen the crowds in the shoulder season, while the high elevation of Bryce Canyon tempers the summertime heat of Southern Utah. We enjoy the back way to Bryce, via the Skutumpah Road (weather permitting) for a quick view of Royal Bull Gorge and an easy side trip down Willis Creek Slot Canyon. BaseCamp 37° is 89 easy miles from the Grand Canyon North Rim Lodge. Arizona Highway 67 provides the main access to the North Rim. Stop for cookies at Jacob Lake to add to your picnic. Its always cool up there, so this is a great option to take a break from the summer time heat. Most facilities at the North Rim close every year on October 15 and reopen in Mid May. You can still make day trips to the North Rim until Arizona Highway 67 is closed for the winter, usually around December 1. One of the most iconic images in the Southwest, Horseshoe Bend has seen staggering growth in it’s popularity. The parking lot and trailhead are just south of Page, Arizona on US 89. The three quarters of a mile trail will deliver you to a 1000′ vertical drop off, where the Colorado River slices through the sandstone in a near perfect horseshoe formation. The National Park Service runs the public access point to Horseshoe Bend, click here for latest info on parking. Zion, Antelope Canyon, and Horseshoe Bend Viewpoint have captured the imagination of the Instagram era, and each has done so for very good reasons. Pack your patience, sunscreen, extra water and be prepared for a dose of chaos at each. BaseCamp37° suggests these alternatives for those looking to avoid the masses. First consider Horseshoe Bend Slot Canyon as an alternative to Antelope. Secondly, take in Horseshoe Bend from the bottom up, floating under the 1000′ cliffs lined with people. Lastly, consult your BaseCamp37° host for tips on visiting Zion. We’ve learned a trick or two over the years. Scoring a Wave permit is difficult at best. The Kanab GSENM Visitor Center runs a walkin lottery every day between March and October for ten total permits. During the winter months (November-February), you can improve your chances by stopping in on a Friday, as they conduct three days worth of lotteries each Friday. The next best thing to securing a Wave permit is having a back-up plan to see the lesser known, but equally stunning siblings of The Wave. We can help you formulate such a plan. For those with an adventurous spirit and vehicle to match, the trailhead for The Wave can be reached directly from BaseCamp 37° without driving a single stretch of asphalt. 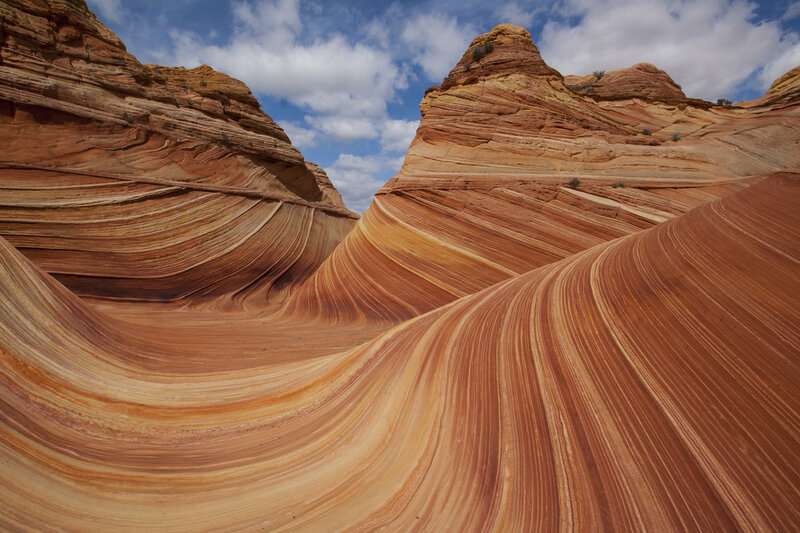 For our money, White Pocket is every bit as impressive as The Wave and does not require a permit, just the fortitude and skill required to navigate the sandy roads within the Vermillion Cliffs National Monument. Local Guides offer trips for those without a proper vehicle. BaseCamp 37° has detailed maps and directions to White Pocket for those equipped and daring enough to drive themselves. This mammoth area features several access points with an untold amounts of colorful formations, slot canyons, and desolation . GSENM starts about 15 miles east of BaseCamp 37°. We strongly advising using the resources provided at the GSEMN Visitor Center in Kanab. The friendly folks at the BLM will have updated road conditions as well as suggested itineraries. Some of our favorites include the primary shooting location for The Outlaw Josey Wales Paria Townsite , the Toad Stools (very easy access), the Hackberry Slot Canyon , and the Cottonwood Narrows . With 1900 miles of shoreline, Lake Powell offers precious few places when one can simply drive up to a beach to enjoy a picnic and a swim. Lone Rock Beach is the only reasonable option. Located 62 miles east of BaseCamp 37°, the beach is great spot for kayaking, swimming, and watching amateurs get vehicles stuck in the sand or in the rising waters of Lake Powell. Looking for a great swimming hole to cool off after hiking the local slot canyons near Page? Just east of the Glen Canyon Dam Bridge, turn north at the brown hiking sign and follow the gravel road down to the lower parking lot. Grab your supplies and scamper down the slick rock to the crystal blue waters of Lake Powell. The Visit Southern Utah website has a great collection of maps to many local destinations within a few miles of BaseCamp 37°. Click here to print. Check out what a 6 day plan looks like to really soak in the beauty Southern Utah. A big part of the Kanab community, Best Friends is one of the largest animal sanctuaries in North America. Best Friends has a visitor center in Kanab. The sanctuary itself, is north of town, 16 miles from BaseCamp 37°. Insider tidbit: The cafeteria is open to the public for lunch. $5 all you can eat vegan buffet. The views from the deck are breathtaking. Wire Pass is a short slot canyon that allows easy access into Buckskin Gulch. At 12.5 miles in length, Buckskin Gulch is one of the longest slot canyons on the planet. You will need two important items for a fun and safe day in Wire Pass & Buckskin Gulch. #1: Current road conditions for House Rock Valley Road, check at the GSENM Visitor Center in Kanab. #2: Current weather conditions and a forecast. You do NOT want to be anywhere near this area during rain, the flash flood potential is great and can be exceedingly dangerous. Cottonwood Cove and Paw Hole are also accessed via HRVR. BaseCamp37° provides some of the closest accommodations to these hiking gems. The most accurately named State Park in Utah, over 3000 acres of dunes in hues of pink and coral. This is basically an ATV park, with most of the terrain available to off road enthusiasts. The road to the state park is paved, however, all of the side roads feature deep sand. We tend to leave our Toyota FJ near the pavement and explore these areas via ATV. Another favorite to beat the summertime heat in Southern Utah. The rim at Cedar Breaks sits about 10,000 feet above sea level and overlooks a fabulous natural amphitheatre of orange and pink formations. For those seeking even thinner air, Brian Head Peak is just up the road, where a gravel road will take you to the top at 11,307 feet. This area was “discovered” after appearing in the Sept. 1949 issue of National Geographic. Later it was named after the famous brand of film. Off the beaten path with a good network of trails for hiking and mountain biking, Kodachrome Basin State Park can be reached on pavement from Bryce Canyon or from the south via the Cottonwood Canyon road. This byway suffers frequent closures, always check with the GSENM Visitor Center in Kanab for updated conditions. We enjoy this southern approach when conditions permit. Favorites along the way include quick hikes into Hackberry Slot Canyon, the Cottonwood Narrows, and Grosvenor Arch.